of the automobiles driving through the mountains and enjoying the panorama. In reality the race was not so comfortable. The total distance was split into four days and run over four stages. 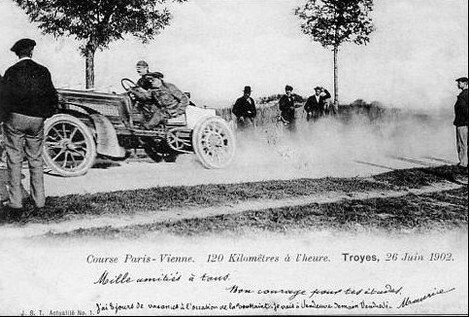 Competitors in the Paris-Vienna race arriving at Troyes at 120 km/h according to the postcard. The Swiss did not allow racing, so the participants had to drive less than 25 km/h through Switzerland. The very dusty roads made it sometimes impossible to see anything. 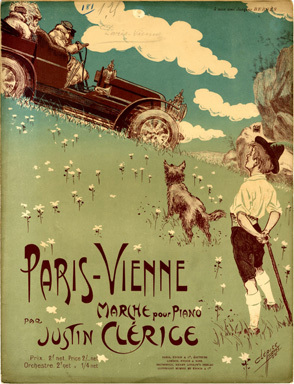 Two of the participants were Louis and Marcel Renault. Louis, a daredevil like his brother, had an accident because he decided not to ignite his lights in fear of losing time. In the dark, he missed a curve and smashed his car. One wheel was immediately repaired with the help of a chair and a penknife. A blacksmith had to repair an axis. And while driving his co-pilot had to constantly fill the radiator with water. Still he managed to finish the race in 28th position. His brother Marcel did better and won the race. 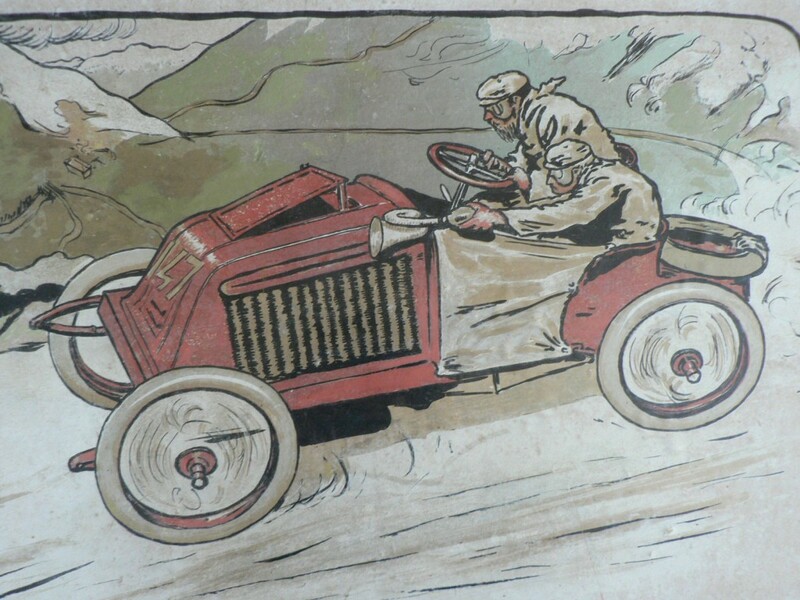 Lucien Faure drew Marcel Renault in full action. 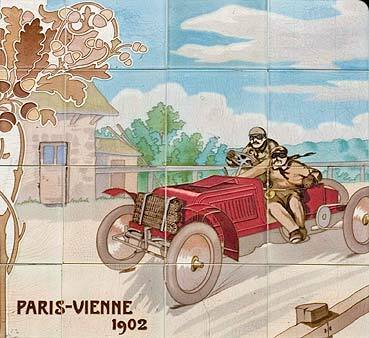 The heroic Paris-Vienne race was also immortalised in ceramic tiles for the Michelin house in London. Marcel Renault was killed the following year during the Paris-Madrid race. The news of this disastrous event made it to all the front pages and -together with other tragic incidents during the race- marked the end of the city-to-city races. Except perhaps for the Dakar..?